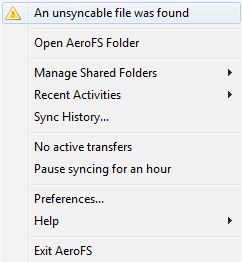 Due to some incompatibilities between various operating systems and file systems, AeroFS will not always be able to save the file to disk even though the file is synced; the file lives in a limbo state where you, as the user, cannot access it. How to handle unsyncable files? 2. Click on the menu item, which will open a dialog showing you a list of files that cannot be synced along with the reason in the column called Detail. Conflicts with <filename>: AeroFS has found two filenames that only differ by case. For example, "Hello" and "hello" on Linux are two different files, and on Windows and OSX, it's the same file. This wreaks havoc on syncing and we recommend that you rename the file. Filename too long: All file systems has a limit on how long a filename can be. Please shorten the filename to resolve the issue. Forbidden characters: A filename is not valid if it contains certain characters. OSX and Linux accepts just about anything, Windows doesn't like a long list of characters. Renaming the file will resolve the issue. Reserved filenames: Windows disallows certain filenames for legacy reasons. You can also resolve this by renaming the file. Non-NFC characters: Mac OS X does not play well with filenames containing accented / non-NFC characters. Renaming the file to use only NFC characters will resolve this issue. Trailing space or period: Delete the trailing space or period to resolve. Lack of permission or disk error: Please make sure you have read/write permission to the folder where you want to save the file. You can also check to see whether you can save anything else to your disk.